Lost Planet 3 happens in space. More specifically, future space. And it'll have the star-faring ships and unlimited-ammo pistols that make sense in a sci-fi series. But the threequel will also let you blast a centuries-old bolt-action rifle at those nasty Akrid. What's up with that? Even, if you account for the fact that LP3 happens way back in the timeline of Capcom's futuristic shooter series, it doesn't make a whole lot of sense to have a weapon John Marston might've used against bears. But there it is, in the hands of LP3 protagonist Jim as he ventures onto the icy plains of planet E.D.N. III. Turns out that the rifle's a family heirloom, passed down for generations and stands as a signifier for the frontier vibe that dev studio Spark Unlimited wants to impart to this new game. This is a different E.D.N. III, one less explored than in LP1 & LP2 and humanity's just beginning to find out what else is living on the frozen planet. The developers from Spark at the E3 demo made it seem like Jim's bolt-action rifle had been a weapon that had helped his forebears lay claims to stakes of land in the old American West. And now, Jim was getting his chance to do the same on E.D.N. III. Fittingly, there's also a bit of gold rush mentality to LP3. The planet's stores of thermal energy are a valuable energy source that also serves as the in-game economy. As described before, Jim's a different sort of hero, just a regular guy scrapping for a living in the outer reaches of colonized space and he'll need credits to upgrade his weapons. You'll stumble on thermal pockets during LP3 exploration sequences and can harvest them by planting posts into the ground. The longer that a thermal post stays in the ground, the greater the amount of energy you can collect gets. But, Akrid will be drawn by the heat and will swarm all over your post over time, laying explosive eggs and creating a zone that you'll need to clear out if you want to collect that precious resource. The bang-shk-clank of the bolt-action rifle's shoot/reload sequence makes for a distinctly different sound effect when placed in LP3's eerily quiet environs. When waves of Akrid are attacking form multiple angles, each reload sounds like desperation. Capcom and Spark say that the game is "not horror" and "not survival" but that they're trying for a more atmospheric experience than in previous games. That's where the new dynamic weather system will help. While some of the snowstorms that Jim trudges through will be scripted to happen at specific points in the story, others will happen at random. 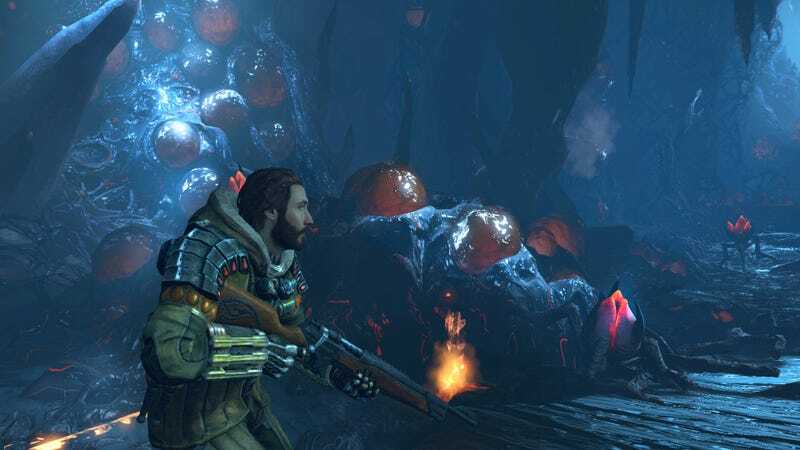 Lost Planet 3, like more and more of Capcom's games, comes from the co-mingling of Japanese and Western sensibilities and that heirloom rifle is just a small sign of the kind of details that wouldn't otherwise be in the game. If Spark manages to create a sense of frontier spirit in this newest game, Lost Planet 3 could give the series a hot dose of what it's needed most: personality.